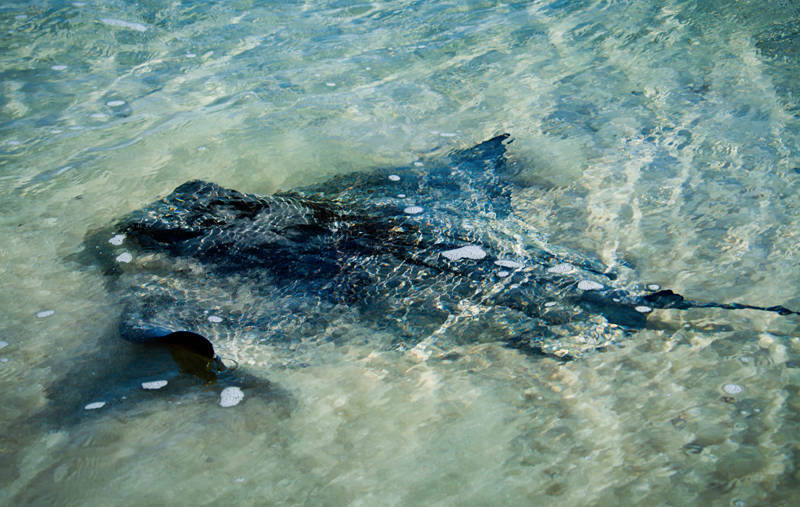 We saw this stingray in the ocean on our walk along Four mile beach on Sunday. I followed it for a while by walking down the beach trying to get a good shot of it. They have the ability to disappear under the sand at a moments notice. This one did not seem to mind me snapping away as it glided along the shallows at a slow walking pace. One problem with shooting through a zoom lens is you have no reference for how close you actually are to the subject. I had to keep peering over my camera to make sure I did not step on it. Although not generally aggressive towards people they are related to sharks and if they feel threatened they can strike out with a venomous barb in their tail. Fatal attacks have been known, most famously on former Aussie crocodile wrangler Steve Irwin, but generally a stingray attack will only result in a severe disinclination to boogie.